The Panzerkampfwagen 35(t), commonly shortened to Panzer 35(t) or abbreviated as Pz.Kpfw. 35(t), was a Czechoslovak-designed light tank used mainly by Nazi Germany during World War II. The letter (t) stood for tschechisch (German: "Czech"). In Czechoslovak service it had the formal designation Lehký tank vzor 35 (Light Tank Model 35), but was commonly referred to as the LT vz. 35 or LT-35. Four hundred and thirty-four were built; of these the Germans seized two hundred and forty-four when they occupied Bohemia-Moravia in March 1939 and the Slovaks acquired fifty-two when they declared independence from Czechoslovakia at the same time. Others were exported to Bulgaria and Romania. In German service it saw combat during the early years of World War II, notably the Invasion of Poland, the Battle of France and the invasion of the Soviet Union before being retired or sold off in 1942. It was used for the remainder of the war by other countries and as a training tank in Bulgaria into the 1950s. 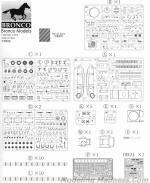 This kit is provided in conjunction with SKP Models of the Czech Republic. 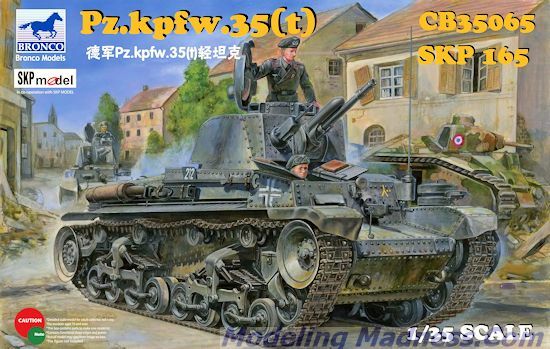 Looking at SKP's small catalogue, I notice it includes the GAZ 69 and Cromwell tank so it is quite probable that this isn't the only time the two companies have cooperated with products. Other than not having a full engine, the interior is quite complete. There is a full driver's station along with ammunition racks and canisters as well as a large radio suite and interior seats. 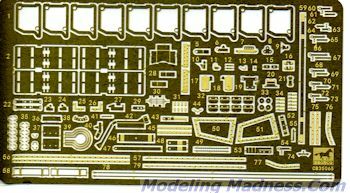 Since the kit does not have a one-piece hull, you basically build all these pieces onto each of the side sections or the floor before assembling them all together. There is a rear bulkhead to which one attaches things like the engine fan and intake filters. All of this is quite complex and so one needs to carefully follow the instructions when building all this. Not surprisingly, a goodly portion of the photo etch is used on the inside though even more is used on the exterior in the form of braces, removable panels and the weld seams for the Jerry cans. In line with other Bronco kits, there are bolt heads on the sprue runners that are to be used, in this case, on the tops of the leaf springs for the suspension. Speaking of the suspension, this kit has individual track links that simply snap together once they have been cleaned up of the mold lines. This should allow the proper sag of the upper run and make it easier to install as well. The upper hull pieces and fenders are well done and festooned with the usual pioneer tools and in this case, a rack for the Jerry cans. Again, photo etch is used for brackets and other small parts. With a nicely done interior, you'd expect the turret and main gun to also be well done and it is. There are various hatches on the tank that are separate and many of them can be posed open. This includes the large ones for the engine compartment, despite the fact that there is no engine. Apparently one is or will be available in aftermarket to make use of this feature. Instructions are the usual color book with well detailed construction steps. One will need to study them before construction to see what is expected as there are places where either holes must be drilled or filled. 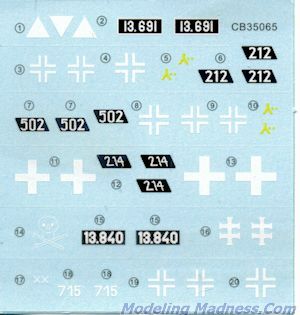 Markings are for six vehicles. Two of them are in the green/brown/tan scheme used by the Czech army in 1937 and 1938. The other four are in panzer grey. One is from Poland in 1939, two are France in 1940 and the final one is from the Russian invasion of 1941, their last combat use. The decals are nicely done and should prove to work just fine. 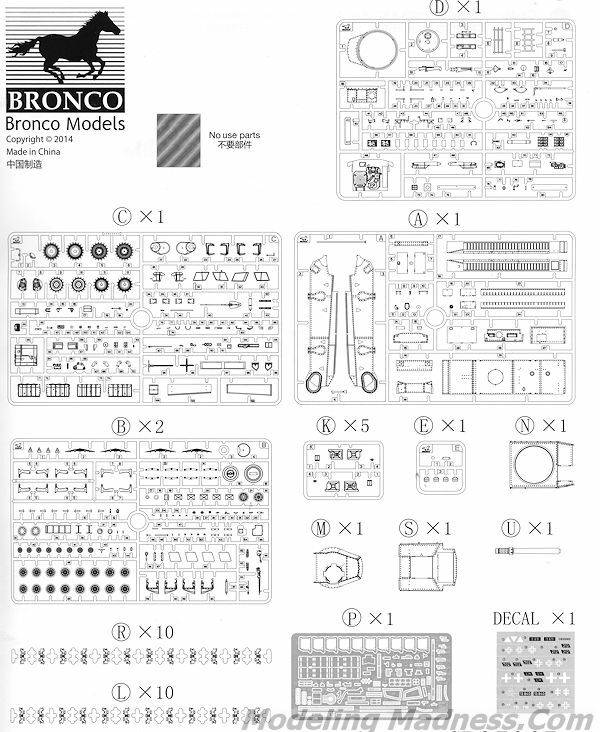 You know when you get a Bronco kit that it will be highly detailed. They have built quite a reputation around that fact and this one is no exception. Despite being only about 6 inches long, it is packed with features. It will not be a quick build, but will reward the builder with an exceptionally detailed model. Thanks to www.dragonmodelsusa.com for the preview kit. You can get this today at your favorite retailer.